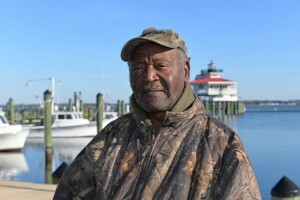 The journey has not been easy for local, award winning skipjack Captain Kermit Travers. Growing up with a lot of responsibility at an early age has contributed to his work ethic and made him who he is today. In October 2015 at the age of 78 he won Maryland’s Achievement in Living Traditions and Arts (ALTA) award. Throughout his life he has been recognized in local shucking competitions and placed 3rd in a worldwide shucking competition. He is charismatic with a voice drenched in wisdom and experience. Travers was born on August 13, 1937 in Blackwater, Maryland to a poor family. When he was in the 10th grade, his parents became too sick to work and he dropped out of school to provide for his six younger sisters. While trying to find a way to make a living he noticed men coming home with money after oystering. He thought if he had a chance, he would give it a try, and in 1958, he had his first chance. He depended on the water, and learned as much as he could about oyster dredging and being a captain. The path he took for more than 20 years included the roles of jiff man, yard boat man, and helping to haul the main sail. Travers was presented with the opportunity to be a skipjack captain but was reluctant. He states he was classified as a full captain for about two years, but he was prepared for nearly thirteen years. Although, he did not think he was good enough, all the men he worked with knew he was ready to take the helm. His inspiration comes from his mother who did her best to take care of their family. She constantly poured words of inspiration and motivation into him pushing him to be his best. “My mother taught me ‘you might not be as good as others but if you try hard enough and believe in yourself you can always accomplish it’,” he said. Captain Travers’ success story is an example to hardworking people to simply try and do the best they can possibly do. One of his best memories as a captain is when he stopped at an unusual place to dredge oysters. He chuckled and stated he caught his limit so fast that day everyone thought he was broke down. He always loved working on the water through cold weather, sea sickness and more. In addition he held various important positions in his community such as a fireman and deputy sheriff. He has fifteen children, some of which are nurses, paramedics, police officers, serve the country, or own small businesses. Nowadays, if he is not spending time with family, you can catch him cracking crab claws or at an oyster shucking house on Tilghman Island.